Errol Spence Jr. vs. Mikey Garcia: Why this Trend has to stop. 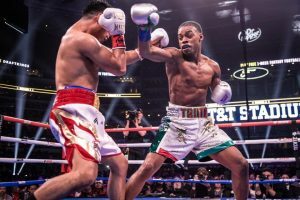 There is a reason there are weight classes in boxing, and the mid-March main event between Mikey Garcia and Errol Spence Jr proved it. While it is great to see two star names face off against each other, it is not so great to see a one sided beat down. The fight started off well enough, showing signs of a high level chess match between two fighters who didn’t want to risk it. Anytime you have such a boxing match, you get butterflies in your stomach, the stakes are high, and you can’t imagine any one guy losing. But by the 4th round, the verdict was clear. Mikey was using his boxing skills to survive, and all the thrill was extinguished. It became a boring one sided match after that. All three judges didn’t give a single round to the Oxnard native. One can perhaps argue he won the 2nd round, it was the round where he found the most success, coming to the center of the ring to meet Spence. But that allowed Spence to gauge his opponent’s power, which he didn’t respect at all for the rest of the fight. He walked Mikey down, he swiveled on his pivot foot, and he landed power shots after power shots for the rest of the fight. When there was a lull in action, Mikey was only too happy to not press the action. It was clear that his aim changed midway, from wanting to win, to wanting to survive. Survive he did, but only just. There were multiple occasions in the fight where it looked like Robert would throw in the towel. Mikey would not fire back, as Errol came agonizingly close to scoring a technical knockout. We have seen referees waive fights off for less. To be fair to Mikey, he acknowledged his severe limitations in the post presser. He said he wanted to hang in there knowing the nature of boxing, and that one punch could change the course of the fight. But given how Spence was using his range so well, and given that he was the much bigger man in the night, there was no chance of a lucky haymaker landing. Spence was too strong on the inside, and too skilled on the outside. He toyed with Mikey, and maybe would have knocked him out another night. After seeing such an uncompetitive fight, looking back at when the details of the fight was first released, it is even more bizarre why Mikey came straight to 147 from 135. Surely if he was avoiding Lomachenko at 135, he could have at least tried his luck at 140 first? He tried pulling a Khan, referring to Khan’s logic in fighting Canelo in a low risk high reward outcome. The fight fan hopes that this trend does not stick. Yes, one wants to see the best fight the best. But in their own weight classes, or at least one weight class apart from each other. There are some media members talking about how they learned more about Errol’s skills over the weekend. How he made the fight look easy versus one of the most technically correct fighters in the sport in Mikey. While these are fair observations, they are rather naïve when considering that boxing is the hurt business. When you are hit hard, you get the urge to shut shop down for the night. You become sluggish and all your skills go flying out the window. The fight stopped becoming a chess match 3rd round onward, transforming into an exhibition. But it should not have been that, Errol’s job was to knock Mikey out as soon as possible from then on. He played it safe, he knew his opponent was trying to survive and was too hurt to connect with any meaningful shots himself. Thus he took his time to put on a controlled boxing masterclass, where he knew his opponent didn’t have the power to upset him. That is not a testament to his boxing skills, that’s just being smart. He will still need to fight someone like Crawford at 147 in order to really test his boxing abilities. But in the meantime, it’s a fantastic name to have on his resume and gain more exposure. The Garcias are great boxing strategists, and are boxing royalty, whatever game plan they had for Errol clearly did not work. This may deter other challengers who are moving up to try the Dallas native. Even a high reward low risk scenario may not be convincing enough for them, because they do not want to get beat up like Mikey did. So such a fight did make Erroll look that much more invincible in the boxing solar system. But truthfully, Eroll has already reached a level where no other challenges except Thurman, Crawford and Pacquiao makes sense for him. He realizes it too, calling out Pacquiao in the post-match interview. But despite the positive consequences of the fight outlined above, one sure hopes it doesn’t become a popular trend. We don’t really get to learn anything new by observing such spectacles. Despite what happened on March 16th, Mikey Garcia is not as bad of a boxer as he was made to look, and Errol Spencer Jr is not as good of a boxer as he was made to look. It would be foolish of the media and fans use those narratives to create stories about the future legacy of the fighters. March 16th should be treated as a hiatus in the records of both fighters, an interesting night for boxing, where two huge stars squared up to put on a card that would be worth of a FOX PPV. The only meaningful result that would change any perceptions would be a Garcia victory. Anything else would be business as usual, and both fighters would shake hands for doing a good piece of business before returning to their real careers. And that is exactly how things panned out.